I'm not sure if this piece has a specific name or not, but it's part of the Offcut series by Beaudoir. 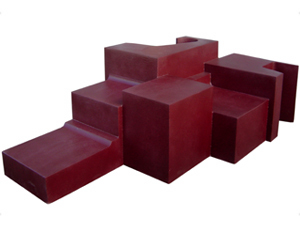 The Offcut stuff is a line of oddly shaped foam furniture that looks like sculpture but is actually seating. I love furniture that's a cross between art and architecture because, even if you're not sitting on it, it's still a pleasure to look at. The drawback, of course, is that this type of furniture is generally not comfortable for everyday use, and this unnamed Offcut piece is no exception. It'd be great in the lobby of my hip Soho business (if I ever have one, that is), but I doubt it would get much use in my livingroom. I wouldn't mind seeing a non-foam, scaled down version as a coffee table, though. Hey Beaudoir, you listening? So where can you buy this? No idea, although it definitely seems for sale. I just can't find a product or price list for it. Judging by the pictures on the Beaudoir site, you can get an Offcut in just about any color, which is a good thing because the weird chocolate-purple of this one is not the most appealing look I've come across. Pricing? No clue. It actually does look like huge wierd pieces of chocolate in the colour shown. you. get. used. to. it. Yes, but in Bloglines and other aggregators, it looks pretty silly. I sumbled across a similar concept in the foyer of the Cadbury Chocolate Factory in Dunedin, New Zealand. It was far better suited for a real loungeroom. It was made stiff foam and covered in a red fabric and curved in a wave design around the inner corner of the room. It stepped up and cut away here and there and formed little nooks and cranneys with built-in down lights from the ceiling that looked like perfect little reading corners. It was very very comfortable.